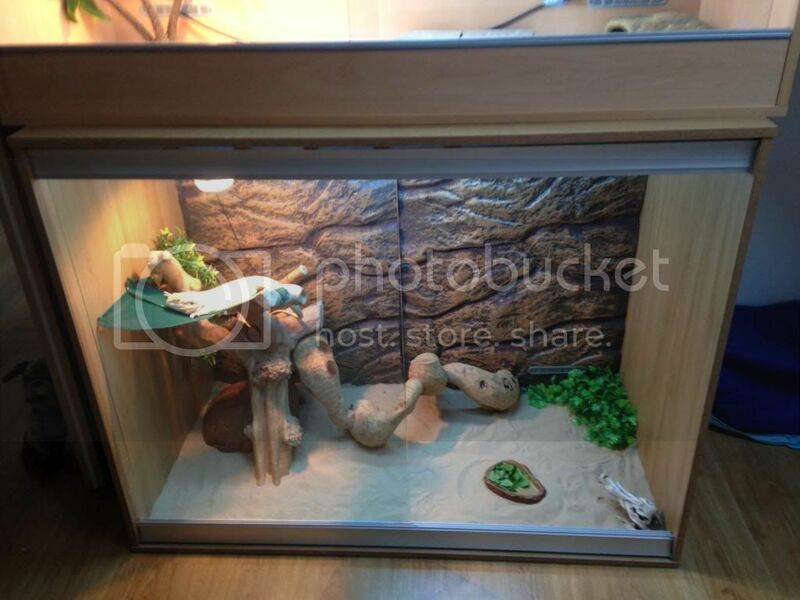 I see what you mean, ive just put it in norberts new viv, looks much better than plain wood though! Thanks, its impossible to get the 2 bits to match up which is annoying, seems like it wouldnt have been that hard to make the pattern of rocks so they could be joined with no obviously visible gap. Norberts about to go into brumation for the first time so i could have really waited until after to buy him a new viv, but he has climbing space now which he didnt have before, once he's come out of brumation and isn't grumpy anymore im sure he'll love it. Reuben's showing no signs of slowing down for brumation currently, as active as ever despite the shedding blues. Got to figure out moving him and the 5ft viv as we're moving house early November. Should be fun, can't help thinking it would be easier if he was brumating. Im sure he'll be fine if you put everything back in the viv exactly as it was, does he get the hump with car journeys?